A crawler camera system is an advanced and portable video inspection system. These systems are built to withstand harsh environments. They are technologically advanced to deliver operator-friendly data reporting as well as crystal-clear images. In addition to this, crawler camera systems are undergoing advancements at a rapid pace currently. They are being largely used in different types of applications worldwide. The global crawler camera system market is expected to expand at a sluggish pace during the forecast period. Growth of the market is primarily attributable to increasing demand from municipal, industrial, and residential applications. Across the globe, different types of crawler camera systems are available in the marketplace. These systems are gaining significance also due to their growing adoption for use in different types of pipeline inspections. Crawler camera systems offer various advantages for use in pipeline inspection, as they have a comfortable grip that is helpful to hold the handheld control console for lengthy operations. Also, they are lightweight, robust, and reliable in nature. Moreover, crawler camera systems are portable in nature, which makes their access to any remote location easy. The global crawler camera system market is estimated to reach value of US$ 187.6 Mn by 2027 from US$ 136.8 Mn in 2018, registering a CAGR of 3.6% during the forecast period. Crawler camera systems are witnessing increase in the demand due to the rising demand from municipal as well as residential applications. When used for pipeline inspection, crawler camera systems provide information on the condition of pipe defects, separated pipe joints, leaks, blockages, and other obstacles that are difficult to detect physically by humans. Furthermore, crawler camera systems can reach inaccessible areas such as large offsets, restricted pipes, protruding pipe tapes, flood drains, and interiors of water sewers. Increasing demand for remote-operated inspection systems is expected to drive the global crawler camera system market during the forecast period. In order to raise the safety level and minimize the number of errors during remote-operated inspections, various municipal corporations are adopting crawler camera systems. This is projected to propel the global crawler camera system market in the next few years. Moreover, crawler camera systems are being adopted largely in end-user applications such as oil refineries, oil pipeline transmissions, gas distribution networks, pharmaceutical, food & beverages, and land field recycling. On the other hand, high prices of crawler camera systems and lack of skilled force are major factors expected to hinder the global crawler camera system market during the forecast period. The global crawler camera system market is consolidated in nature, with a limited number of companies operating at the global level. Leading players are currently focusing on providing technologically advanced products to their customers. Increasing demand for crawler camera system-based inspections is expected to prompt investors to invest in this new technology in the near future. 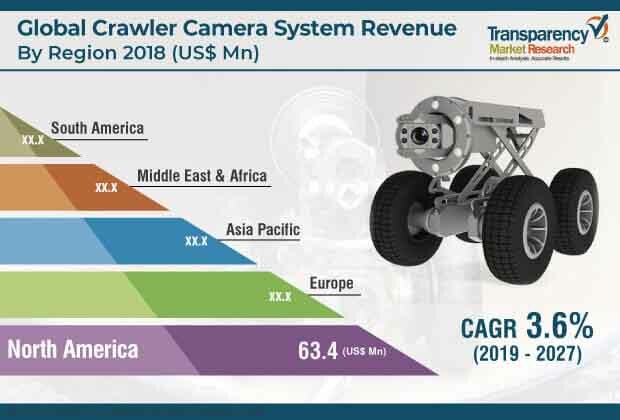 In 2018, North America hold a major share of the global crawler camera system market and it is expected to continue its dominance throughout the forecast period. Adoption of new technologies, availability of developed infrastructure, and consistently expanding cities in North America are factors responsible for dominance of the region. The market in Asia Pacific is expected to expand at the maximum CAGR during the forecast period. Some of the major players operating in the global crawler camera system market and profiled in the study are AM Industrial (UK) Ltd., CUES Inc., Deep Trekker Inc., Inuktun Services Ltd., iPEK International GmbH, Kummert GmbH , Mini-Cam Ltd., Rausch Electronics USA, LLC, Subsite Electronics, and INSPECTOR SYSTEMS Rainer Hitzel GmbH. This comprehensive report by Transparency Market Research analyzes and forecasts the crawler camera system market at the global and regional levels. The report provides analysis for the period from 2017 to 2027, wherein 2019–2027 is the forecast period and 2018 is the base year. An in-depth and unbiased market assessment has been made to provide readers with comprehensive and accurate analysis. The report highlights all major trends anticipated to be witnessed in the global crawler camera system market from 2019 to 2027. It also focuses on market drivers, restraining factors, and opportunities for the global crawler camera system market during the forecast period. The study provides a complete perspective on growth of the crawler camera system market, in terms of value (in US$ Mn) and volume (in units), across various geographies including North America, Europe, Asia Pacific, Middle East & Africa (MEA), and South America. The report includes detailed value chain analysis which is focused on providing an extensive view of the global crawler camera system market. Porter’s five forces analysis has also been provided to help understand the competition scenario of the global crawler camera system market. The study incorporates market attractiveness analysis, wherein component, application, and end-use industry segments have been benchmarked based on their market size, growth rate, and attractiveness. In order to offer complete analysis of the overall competition scenario of the global crawler camera system market, every geographical region mentioned in the report is provided with attractiveness analysis. The market overview chapter in the report explains market trends and dynamics that include market drivers, restraining factors, and the current and future opportunities for the global crawler camera system market. Market outlook analysis has also been provided in the report. Additionally, the report provides analysis of different business strategies being adopted by leading players operating in the global crawler camera system market. Market introduction chapter assists in getting an idea of different trends in the global crawler camera system market along with component, application, and end-use industry segments of the market. The study provides a decisive view of the global crawler camera system market by segmenting the market, in terms of component, into camera, crawler, cable & cable drum, control units, and others. Based on application, the market has been classified into drain inspection, pipeline inspection, and tank, void, cavity or conduit inspection. In terms of end-use industry, the global crawler camera system market has been segregated into residential, commercial, industrial, and municipal. The report provides detailed, region-wise segmentation of the global crawler camera system market and categorizes it at various levels, thereby providing valuable insights at micro and macro levels. The report highlights the competition scenario of the global crawler camera system market, by ranking all major players according to their geographical presence and key recent developments. Insights for the global crawler camera system market is a result of TMR’s extensive primary interviews, secondary research, and in-house expert panel reviews. Market estimates have been analyzed by considering the impact of different economic, political, social, legal, and technological factors. Based on country/sub-region, the North America market has been segmented into the U.S., Canada, and Rest of North America. The Europe market has been categorized into France, Germany, the U.K., and Rest of Europe. The crawler camera system market in Asia Pacific has been segmented into China, Japan, India, South Korea, and Rest of Asia Pacific. Middle East & Africa comprises GCC, South Africa, and Rest of Middle East & Africa. Similarly, South America includes Brazil and Rest of South America. This report provides all strategic information required to understand the global crawler camera system market along with component, application, and end-use industry segments of the market. The report provides insights into component, application, and end-use industry segments of the market in various geographical regions mentioned above. The research methodology is a perfect combination of primary research, secondary research, and expert panel reviews. Secondary sources such as annual reports, company websites, SEC filings, investor presentations, national government documents, internal and external proprietary databases, statistical databases, relevant patent and regulatory databases, market reports, government publications, statistical databases, World Bank database, and market white papers are usually referred to. Primary research involves telephonic interviews, e-mail interactions, and face-to-face interviews for detailed and unbiased reviews of the crawler camera system market across geographies. Primary interviews are usually conducted on an ongoing basis with market experts and participants in order to obtain the latest market insights and validate the existing data and analysis. Primary interviews offer new information on important factors such as market trends, market size, competition landscape, and growth trends. These factors help validate and strengthen secondary research findings. Moreover, the data collected and analyzed from secondary and primary research is again discussed and examined by TMR’s expert panel. The research study includes profiles of leading companies operating in the global crawler camera system market. Market players have been profiled in terms of attributes such as company overview, financial overview, business strategies, and recent developments. Parameters such as investments in and spending on crawler camera systems and developments by major players are tracked. Some of the key players operating in the global crawler camera system market are AM Industrial (UK) Ltd., CUES Inc., Deep Trekker Inc., Inuktun Services Ltd., iPEK International GmbH, Kummert GmbH, Mini-Cam Ltd., Rausch Electronics USA, LLC, Subsite Electronics, and INSPECTOR SYSTEMS Rainer Hitzel GmbH.